How cool is this? Much respect to Seth MacFarlane. Until recently, all [of Sagan’s personal papers] had been stacked in filing cabinet drawers in the Sphinx Head, a tomblike secret-society building that became Sagan’s home in Ithaca, N.Y. For years, Sagan’s widow, Ann Druyan, had carefully preserved her husband’s archive, hoping to find an appropriate repository. The Library of Congress had long been interested; the library owns the papers of such innovators and scientific luminaries as Alexander Graham Bell, the Wright brothers, J. Robert Oppenheimer, E.O. Wilson and Margaret Mead. Along came Seth MacFarlane, creator of TV’s “Family Guy” (and director of the new movie “Ted”). Astrophysicist Neil deGrasse Tyson introduced MacFarlane to Druyan when Tyson and Druyan were developing a remake of the enormously popular 1980 PBS series “Cosmos” that made Sagan famous. In the process of backing the new “Cosmos,” MacFarlane provided an undisclosed sum of money to the Library of Congress to buy the archive from Druyan. The library will officially announce the acquisition Wednesday. 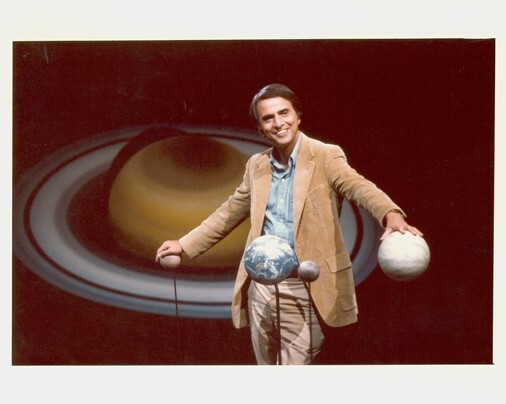 via Library of Congress obtains astronomer Carl Sagan’s personal papers – The Washington Post.